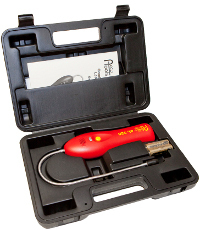 The AccuTools® eL-320 Combustible Gas Leak Detector is an easy-to-use portable combustible gas leak detector that pinpoints large and small leaks quickly. It is ideal for locating combustible gas leaks in appliances and heating equipment in commercial, residential, and industrial applications. The eL-320 is your go-to tool for inspecting valves, regulators, and meters on gas equipment, surveying gas pipelines, etc. Approved by Underwriter's Laboratory for use in hazardous locations, the eL-320 is self calibrating and requires very low maintenance. CLASSIFIED BY UNDERWRITERS LABORATORIES, INC. ONLY AS TO FIRE, ELECTRICAL SHOCK, AND EXPLOSION HAZARDS IN CLASS I, DIVISION 2 GROUPS A, B, C, & D HAZARDOUS LOCATIONS. READ OWNERS MANUAL BEFORE OPERATING. USE ONLY 1.5V AA ALKALINE BATTERIES. Propane, Methane, Natural Gas, Iso-Butane, Acetone, Hexane, Acetylene, Benzene, Butane, Ethanol, Ethylene Oxide, Gasoline, Hydrogen, Industrial Solvents, Methanol, Paint Thinners, Naptha etc. Two sensitivity modes, enabling quick and easy location of large and small leaks. Both visual and audible leak detection signal. Automatic power-off to conserve battery life. 139 TruReward$ points will be placed in your account when you buy this item. in despiration I purchased this detector to find a sewer smell in our bathrooms. I was able to pinpoint the source of the sewer gas leak within 1/2 hour. easy to use & very accurate.